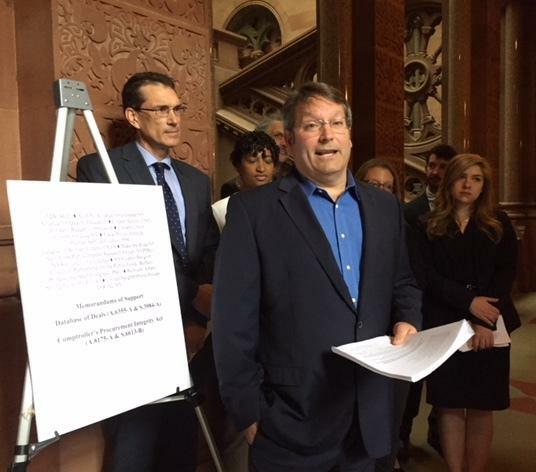 ALBANY, NY (WSKG) – Government reform groups are urging the state Assembly to pass two bills that have already been approved in the Senate that would reform New York’s economic development programs. They say it’s needed more than ever on the eve of another federal corruption trial involving Governor Cuomo’s economic development programs. The former head of high tech development in New York, former SUNY Polytechnic President Alain Kaloyeros, goes on trial on corruption charges June 18th. Ron Deutsch, with Fiscal Policy Institute, says the measures would increase transparency by creating a data base of deals- listing details of all economic development projects that receive taxpayer money. Another bill would restore the state comptroller’s authority to independently review the projects . Deutsch, making a football analogy, says the bill to restor the Comptroller’s oversight is like “adding a referee” , and the data base of all economic development projects gives taxpayers a “slow motion instant replay”. “So you are able to see what’s going on,” Deutsch said. The measures passed nearly unanimously in the Senate, Deutsch and the other groups blame Governor Cuomo for holding it up in the Assembly. A spokesman for the governor denies that, saying the Assembly is their own co equal branch of government. Spokesman Rich Azzopardi says Cuomo supports other reforms for economic development programs, including creation of a special Inspector General to investigate any accusations of corruption.